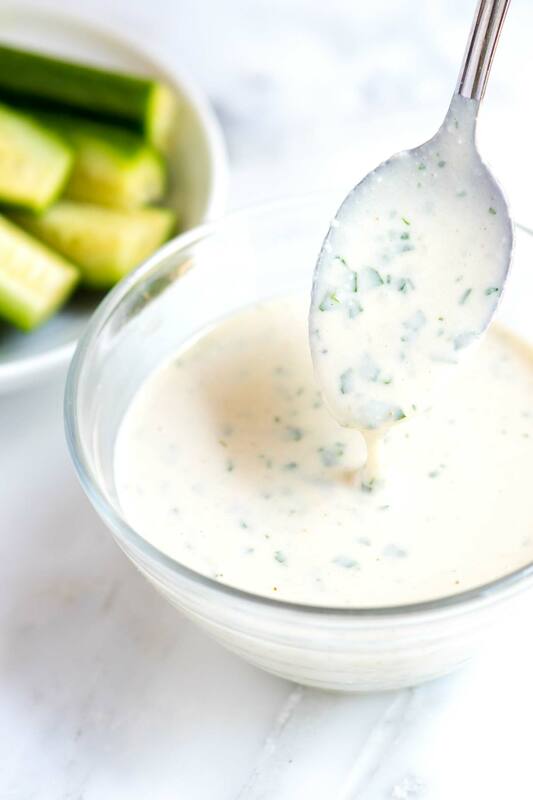 I use this lemony, garlic tahini sauce on everything! 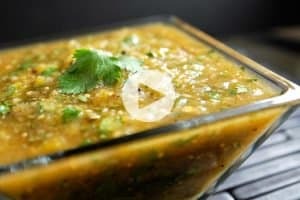 Use this quick and simple sauce as a dressing for salads, a sauce for veggies and meats, a spread for sandwiches and pitas or serve it as a dip. Jump to the Tahini Sauce Recipe or watch our quick recipe video showing you how to make it. Ever since we shared our recipe for making homemade tahini, we’ve been playing around with more ways to use tahini. Tahini is a staple when making hummus, but there are many more ways to use it. This extra easy dairy-free tahini sauce is one of them. I keep a jar in my fridge at all times! 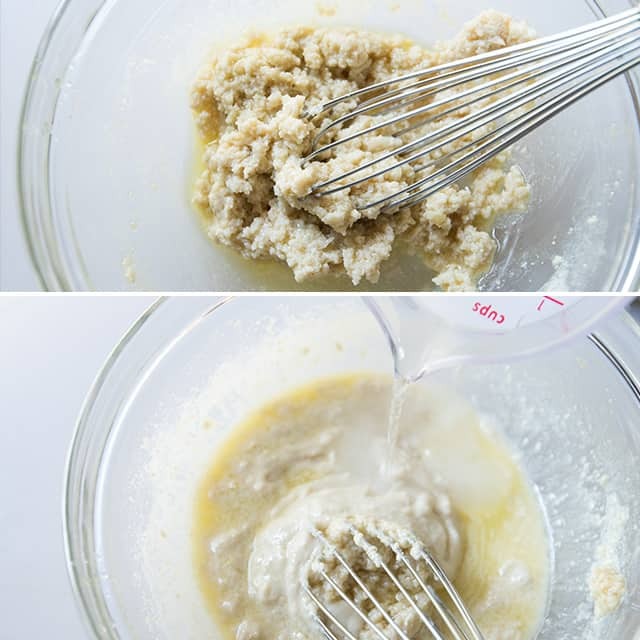 Tahini paste, which can be made from scratch (here’s our easy recipe) or bought at the store. Fresh garlic is a must for me when making the sauce. Since I add it raw, I like to grate it using a microplane or use my knife to turn it into a paste (I’ve shared a photo below). 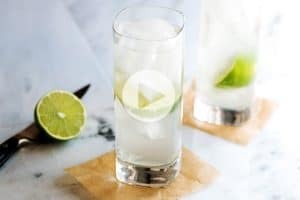 Fresh lemon is another must add for me and I like to add a lot of it. Olive oil makes the sauce smooth and luxurious. Cumin, cayenne, fresh parsley, and salt all add flavor to the sauce. Warm water is the secret ingredient to the smoothest, creamiest tahini sauce. Step 1: Stir tahini, garlic, lemon juice, olive oil, and a pinch of salt together in a bowl. It will start creamy and then might cease up on you — see the photo below. Don’t worry if it looks lumpy, that will be fixed when we add the water. Step 2: Whisk in warm water. The moment you begin to whisk in lukewarm water it turns into to dreamy, creamy sauce. You can add as much or as little water as you like — it all depends on what you plan to use it for. 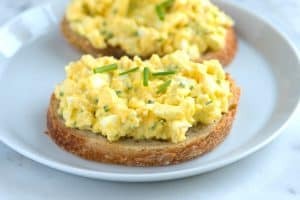 For spreads, don’t add as much. If you want to use the sauce as a dressing or for drizzling, add a bit more. On the top, we’re showing what the sauce looks like before adding warm water. It’s lumpy and definitely not smooth. On the bottom, we’re showing what the tahini sauce looks like after adding some of the water. It instantly starts to turn creamy. Step 3: Add extra flavor with spices and fresh parsley. I love a little smokiness from ground cumin, some spice from cayenne, and a fresh pop of color and flavor from parsley. 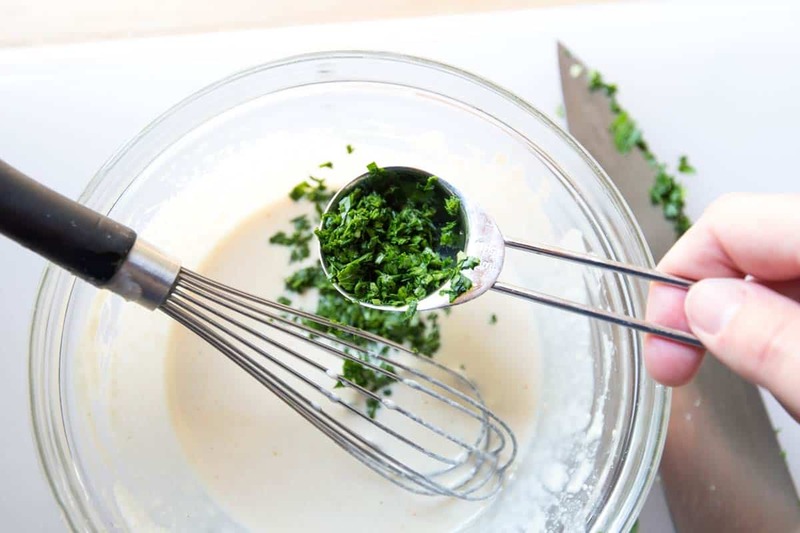 I love adding cumin, cayenne pepper, and fresh parsley to my tahini sauce. Other herbs and spices work, too! The tahini sauce keeps in the refrigerator up to 5 days or so, but we’d be shocked if you didn’t find ways to enjoy it by then! I use this tahini sauce as a dressing for our Easy Kale and Bean Salad. These Honey Roasted Carrots are amazing and drizzled with tahini sauce. We love these Chicken Lettuce Wraps filled with honey dijon marinated chicken, hummus and veggies. I drizzle lots of tahini sauce on top. Use tahini to make Baba Ganoush! It’s an amazing roasted eggplant dip, is so simple to make. Or make homemade hummus! Use this vegan tahini sauce as a dressing for salads, a sauce for vegetables and meats, a spread for sandwiches or a dip for just about anything. It’s very simple to make and is much more than the sum of its parts. Just delicious! Whisk tahini, garlic paste, lemon juice, olive oil and the salt in a bowl until combined — the mixture will thicken, don’t worry about this. Add the water, a tablespoon at a time and whisking well after each addition until desired consistency. If making a spread, look for the consistency of peanut butter. If making a sauce, add enough water until the consistency of runny yogurt. Stir in the optional cumin, cayenne pepper and parsley. Taste for seasoning and adjust with additional salt or lemon juice. Store covered in the refrigerator up to 5 days. How to Make Garlic Paste: Since we are adding the garlic raw, it is best to add it as a paste. To do this, peel and finely mince the garlic clove. 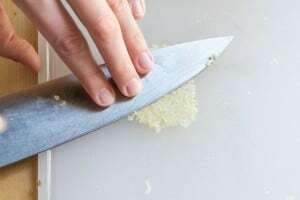 Sprinkle the garlic with a pinch of coarse salt then use the flat side of a knife to drag it over the garlic, scraping it across the surface of the cutting board. Pile up the garlic again then repeat a few more times until the garlic is a smooth paste. The sauce came out bitter… 🙁 any tips on how to fix that? Hi there, Certain brands of tahini can be more bitter than others so changing the brand of tahini or making your own might be best. You can also try adding a little more olive oil to balance it out a bit. Thank you for this recipe. It is delicious! I had a bit of trouble at the beginning (because I hadn’t read the whole text hah) and my sauce wasn’t getting creamy. Then I added more lemon juice. It turned out really lemony but amazing. thank you for the tahini sauce recipe,i cant wait to try it and it is so expensive in the store. 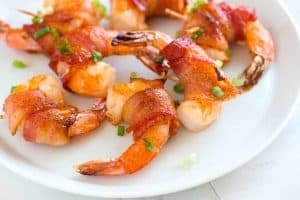 I add a bit more garlic but this recipe is delicious and so easy! I ate 3 salads consecutively I enjoyed it so much. Thank you for the recipe, I’m excited to try it, I’m happy I found Tahini paste ( spicy ) then my Mexican side is happy. This was fabulous! It’s now my favorite sauce for falafals! Such a great sauce! First time ever that I’ve done homemade tahini, and this recipe is delicious–and sooo easy! The hummus is also spectacular. Thanks so much for the recipes. Now I’m going to try baba gonash (sp?)–yum! How long will this last in the refrigerator? Looks delicious but I would be the only one eating it. Thanks! I have kidney disease and salt is something I avoid thank you for your recepies Of course I leave out salt and that does effect taste. I will test my salt substitutes and see which one is the best to enhance flavor! My husband is Arab, so I make a lo of Middle Eastern food. This is the best tahini recipe I have found. Tahini tastes like peanut butter to me, so it really needs to perfect balance of garlic and lemon. I think the cumin, cayenne and parsley make a world of difference. My husband was raised on tahini and he loves it, so that’s something! What is your balance of garlic and lemon? Will be making it soon. Have you got a recipe for Halva. Have you ever made Falafel ? I’d like to see your point how to do it ? And, sorry my manners, your site is wonderful ! Thank you for the tahini sauce receipe. I love all the ingredients and will try the receipe real soon.